Commuters can request a ride to the Mount Baker, Columbia City, Othello, Rainier Beach and Tukwila International Boulevard stations. South Seattle and Tukwila light rail riders now have another option to get to the station. On Tuesday, King County Metro launched Via to Transit, an on-demand transit shuttle system that services five light rail stations. Light rail riders can call or download the Via app to request a ride to the Mount Baker, Columbia City, Othello, Rainier Beach and Tukwila International Boulevard stations from specific pick-up locations inside designated service areas. A ride from anywhere in the service area costs the same as a bus ticket and can only be paid for with an ORCA card or the Transit Go app. 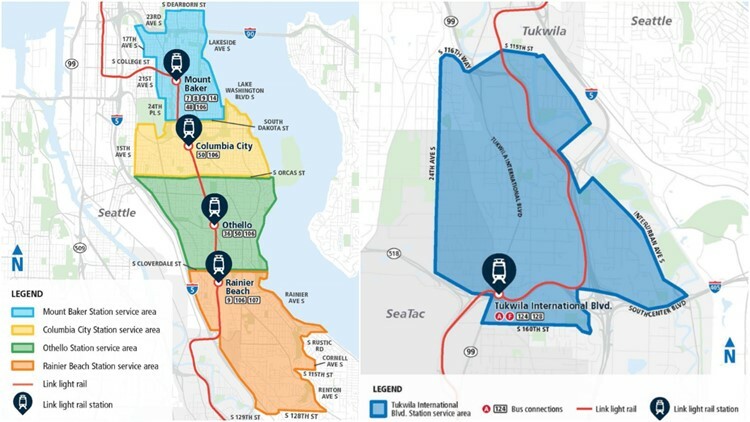 Maps show the shuttle service area in South Seattle and Tukwila. Download the Via app or call 206-258-7739 to request a ride with any phone, not just a smartphone. It's likely that you will be sharing the shuttle with up to five other people since the vans can carry up to six. It should take about 10-15 minutes for you to be picked up, and the pick-up location may require you to walk. The shuttle is mostly funded by $2.7 million from the Transportation Benefit District that voters first approved in 2010 and was later transferred to the City of Seattle in 2016. It is a one-year pilot program. Monday-Saturday: 5 a.m. - 1 a.m.
Monday-Friday: 6 a.m. - 9 a.m. and 3:30 p.m. - 6:30 p.m.